The Institute of Chartered Accountants of Sri Lanka (CA Sri Lanka) renewed the Mutual Recognition Agreement (MRA) with CPA Australia recently, in an effort to enhance the standing of the members of both accounting bodies. 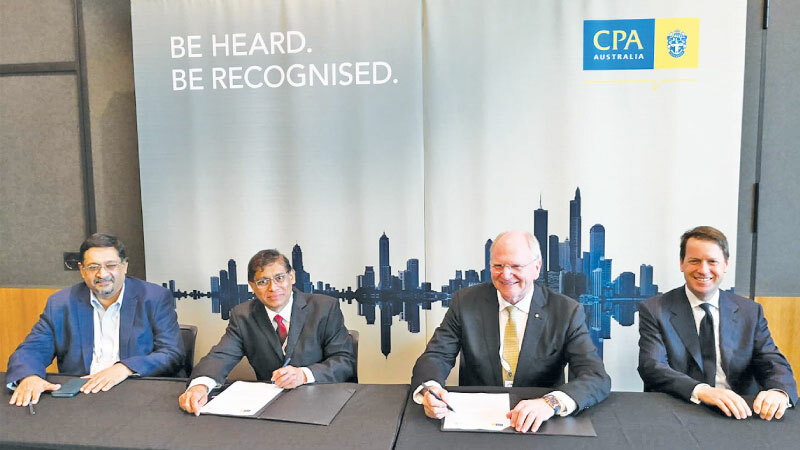 The agreement was signed by CA Sri Lanka President Jagath Perera and CPA Australia President Peter Wilson in Sydney, Australia. The MRA between CA Sri Lanka and CPA Australia removes barriers, allowing appropriately qualified members of each body to apply for membership from the other body, together with the opportunity for closer collaboration and cooperation between the two accounting bodies, in an effort to enhance the accounting profession. Meanwhile, CA Sri Lanka’s President Jagath Perera, Vice President Manil Jayesinghe and Council Members Lasantha Wickremasinghe and N. R. Gajendran met the newly appointed President of the International Federation of Accountants (IFAC) Dr. In-Ki Joo in Sydney, to congratulate him on his appointment. The meeting took place during the sidelines of the IFAC Council and Board Meetings. During the meeting with Dr. Joo, Perera highlighted the steps taken by CA Sri Lanka to enhance the accounting profession and the standing of its professionals in Sri Lanka. CA Sri Lanka is the oldest Sri Lankan member of IFAC, holding membership since 1978 in the global organisation.